If you are planning for the future, you have likely heard a great deal about both trusts and wills. You know they are considered critical estate planning tools. However, without more information, you may get confused regarding the similarities and differences between the two types of documents. To learn more about trusts, wills, and planning for your future, including protecting your wealth and family, contact a West Palm Beach estate planning attorney as soon as you can. A will is a document that states your wishes for how your real estate, personal property, and other assets should be handled when you pass away. You have the right to choose how your assets are distributed to your family and friends. You can dictate which specific items go to which people, you can designate amounts of money to your heirs, or you can simply require your heirs to divide your estate evenly. However you want to handle your affairs is your choice. You simply have to ensure you follow Florida’s rules for constructing a valid will. Otherwise, state law will dictate how your estate is distributed. A trust is a document that puts certain assets under the control of a trustee, which may be a family member or friend, professional, or institution. This party then holds it for the benefit of your designated beneficiaries, which may be one person or multiple. To say the property is held for the benefit of the beneficiaries means the principal assets or the dividends from the invested assets are paid to the beneficiaries at one specific time or in multiple payments over time. There are many types of trusts, including revocable and irrevocable trusts, and those that are in place while you are alive and those that form when you pass away. Our estate planning lawyers can explain all of your different options in regard to establishing a trust. A will only goes into effect upon your death. A trust can be drafted to take effect upon your death as well, but can also be formed and active while you are alive. Wills must pass through probate court while trusts and the property they hold do not. Because a will goes through probate, it becomes public record. Trusts are not part of the public and can remain entirely private, unless there is litigation regarding the trust. Wills can only control the distribution of property at your death while trusts can control the distribution of property for years to come. If you have yet to begin planning for the future and your passing, contact us at the Law Offices of Larry E. Bray, P.A. so we can explain your legal options, including creating a valid will and a trust. 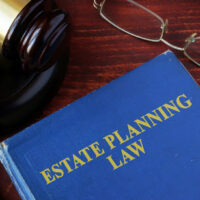 Our West Palm Beach estate planning attorneys are eager to assist you today.